The installation of the unit is very simple, with 2 hose clamps all you need is a flat head screwdriver and 5 minutes of your time. Kentucky Lake is a big reservoir that’s known for big waves and strong winds; the Troll Prefect helps with making quick adjustments with very little effort. I was able to maintain my Ranger Boat in 15mph winds with 2 foot waves with no issues. I really enjoyed this product and this is definitely going to change how we use trolling motors in the future. I have to say that this is one of the simplest products to install and use. Easy to follow instructions make this a breeze to attach to the trolling motor and to adjust it on the water. Unfortunately my pictures of the install did not load on the computer and were lost, but the pictures provided with the product are not much different from my install pictures. Five easy steps and it is ready to use. I have done several product reviews over the past few years and most have been of tackle that promises to catch more fish, but this review is of a product called “Troll Perfect” from Perfect Outdoor Products in Rochester Hills, Michigan and though it doesn’t claim to catch more fish, it will make your time on the water more enjoyable. The product installs in just minutes and only costs $14.95. 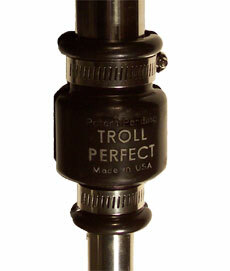 Troll Perfect is so simple use and provides amazing control when putting a boat into 2′ to 3′ swells.